Toyota’s performance as a team started to unravel in the early 80s. In one championship match against Crispa in 1980, Toyota Coach Fort Acuna benched Bobby Jaworski for reasons still unknown to the public. 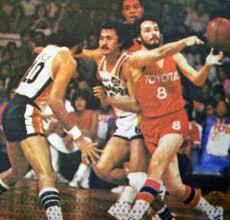 At the halftime break, Acuna was fired by the Toyota management, paving the way to Jaworski’s return. Inspired by the return of their team captain, the team responded with a win, giving Crispa its only loss in the tournament. Fort Acuna would not be able to recover from this episode, and would die of an apparent suicide a year later. Arnaiz leads the Toyota fastbreak. 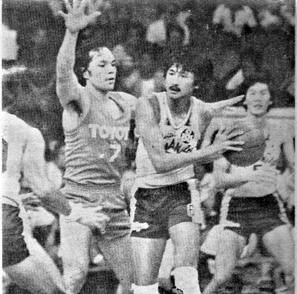 In 1981, Crispa would tangle with Toyota in the PBA Open Conference finals. Toyota would take this one with the help of import Andy Fields. But this would be the last song-and-dance finals for the two arch-rivals. Toyota would take 3 more championships in 1981 and 82, but there was a clear strain already manifesting itself in the way the team played. The Big J confronts the Fortune Cookie. A reported internal struggle for leadership between Jaworski and Mon Fernandez was what gnawed on the team’s cohesion and hence, their effectiveness as a team. Things started to get worse when Crispa – after having taken no championships in 1982 – started revitalizing its bench with the acquisition of talents such as Bernardo ‘Joy’ Carpio, Arturo ‘Bay’ Cristobal, Federico ‘Padim’ Israel, and Elpidio ‘Yoyoy’ Villamin. The infusion of this third wave of stars (remember that coach Baby Dalupan had brought in Atoy Co and company after the suspension of Crispa’s original star-studded line-up? ), plus the arrival of the Black Superman, Billy Ray Bates, had Crispa bulldozing its way to an unprecedented second grand slam season in 1983. 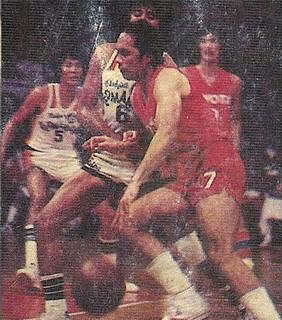 Crispa had authored the first grandslam in PBA history in 1976. Crispa’s Danny Floro and coach Baby Dalupan gets the victory ride. Toyota, seeing that they could no longer catch up with Crispa’s fresh set of legs, disbanded in early 1984, citing financial difficulties as the reason for taking what was initially just a leave of absence. 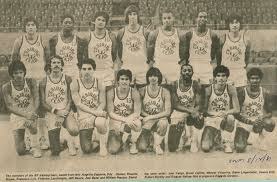 Crispa, despite its formidable line-up, would win only the first conference in 1984. Without Toyota as a dance partner, Crispa was uninspired, playing listlessly like a grandmom who had just lost the grand-dad. It wasn’t long before this grandmom was ready to go to the pastures herself. Never a dull moment whenever the two teams clashed. 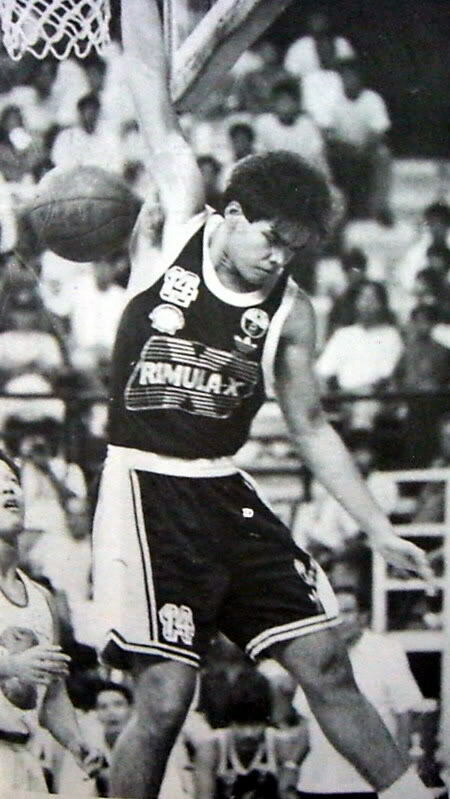 In 1985, exactly a year after its arch-rival left the PBA, Crispa also folded up. 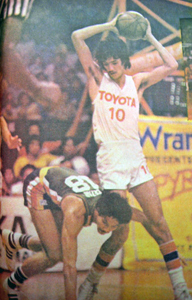 From the start of the PBA in 1975, Crispa collected a total of 13 championships, with Toyota bagging 9. They would have a total of 124 mano-a-mano duels, with Crispa taking 63 wins, while Toyota would take 61. Crispa would take 6 MVP awards, while Toyota would take 2. Crispa would have 6 inductees to the PBA Hall of Fame, while Toyota would have 5. Rival coaches Baby Dalupan of Crispa and Dante Silverio of Toyota would also get inducted to the PBA Hall of Fame. The most colorful rivalry in PBA, and in Philippine basketball, was finally over. It was time for the other teams to take up the cudgels for the PBA. Arguably the most popular rivalry in Philippine Basketball ever. Meanwhile, back in 1980, businessman Danding Cojuangco was appointed by then President Ferdinand Marcos to develop a national basketball team that could be competitive in the international tourneys. Danding formed the Northern Cement basketball team, brought in coach Ron Jacobs and immediately began naturalizing American standouts. This naturalization program was becoming a popular practice in Europe, and Danding saw this as the quickest way to get positive results. 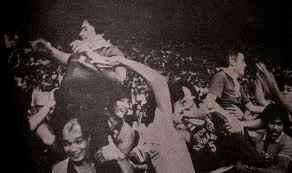 However, despite winning the Jones Cup in 1981, the team failed to get the support of the Pinoy fans. It was clearly a case of foreign mercenaries being tasked to fight the country’s cage wars. This program was stopped, and a program to develop native talents was put in place instead. Danding Cojuangco engineered the Philippines’ return to Asian Basketball respectability. In 1982, Jacobs saw his work finally bear fruit when the Philippines captured the ABC Under-19 championship held in Manila. 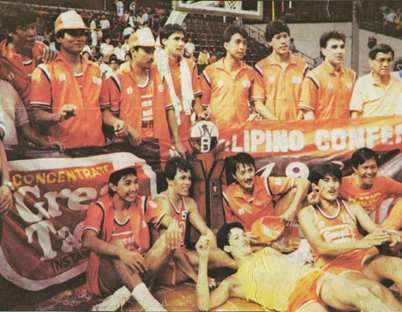 Leading the team then were Hector Calma, Alfie Almario, Elmer Reyes, Franz Pumaren, and Tonichi Yturri. Other standouts who would later join the team were the high-flying Avelino ‘Samboy’ Lim, the hot-shooting Allan Caidic, plus naturalized players Arthur ‘Chip’ Engelland, Jeff Moore and Dennis Still. NCC would continue to develop players in the amateur mold of the Basketball Association of the Philippines (BAP), and would catch the imagination of discerning basketball fans. 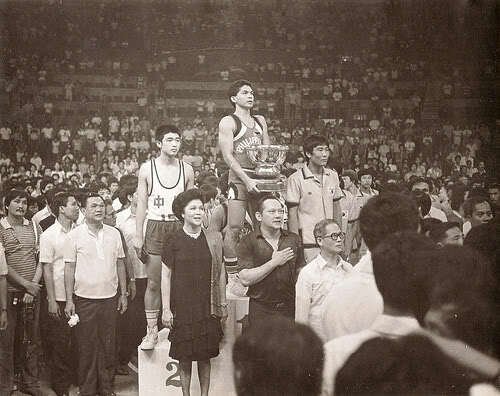 Danding’s efforts bore fruit when the Philippines won the 1982 ABC Youth over a heavily-favored Chinese team. Meanwhile, back in the PBA, Great Taste Coffee loomed as the next superpower, bagging 4 straight crowns from 1984 to 1985. They would become the toast of the PBA with Ricky Brown, the 1985 league MVP; and William Adornado, the PBA’s first 3-time MVP awardee, at the helm; and Manny Victorino, Chito Loyzaga, Joy Carpio and Abe King supporting. Great Taste’s 1-2 punch, Ricky Brown and Bogs Adornado. 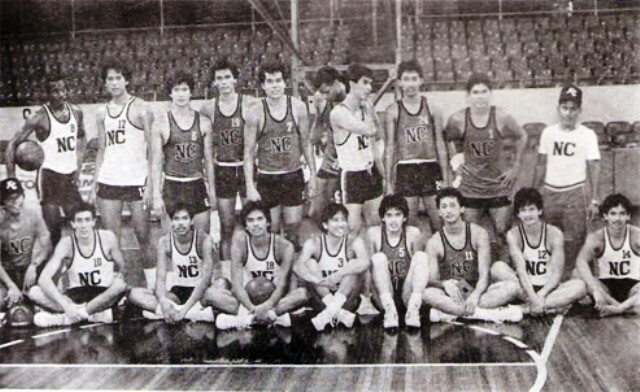 GTC was ruling the PBA when NCC joined the PBA as a guest team in 1984. And it would take NCC 5 tournaments and 2 third place finishes in the 84-85 seasons before they would upend Great Taste’s string of consecutive championships. Along the way, NCC would gain prestige for the country, raking in tournament wins in the 1984 ABC Club Championship, the 1985 ABC Championship, the 1985 South East Asian Games, as well as the 1985 William Jones Cup. Danding pursued his dream of regional supremacy, forming a formidable young team that would provide pleasant surprises. NCC would have one last stab at international glory, representing the country and taking a bronze medal in the 1986 Asian Games in Seoul. The Philippines would suffer a controversial loss to South Korea 103-102, in the first of many heartbreakers the country would suffer against the South Korean teams. Allan Caidic begins to get noticed. The disbandment of both Toyota and Crispa caused a major facelift in the PBA landscape in the mid-8os. While the Coffeemakers tasted how it was to be on top briefly, parity was slowly creeping in. Former Toyota and Crispa players would find themselves wearing the same uniform, and fan loyalty was becoming more distributed. 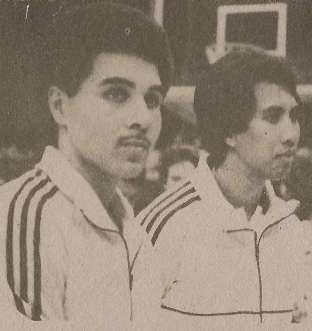 Aside from the star-studded line-ups of GTC and NCC, the mid-80s saw the Batman-Robin tandem of Jaworski and Francis Arnaiz leading the Gilbey’s pack; Fernandez, Atoy Co and Villamin teaming up under Manila Beer; Tanduay had Abet Guidaben, Freddie Hubalde, Willie Generalao; Adornado, Philip Cesar and Bernard Fabiosa moved to Shell. GTC starts a mild run of titles. 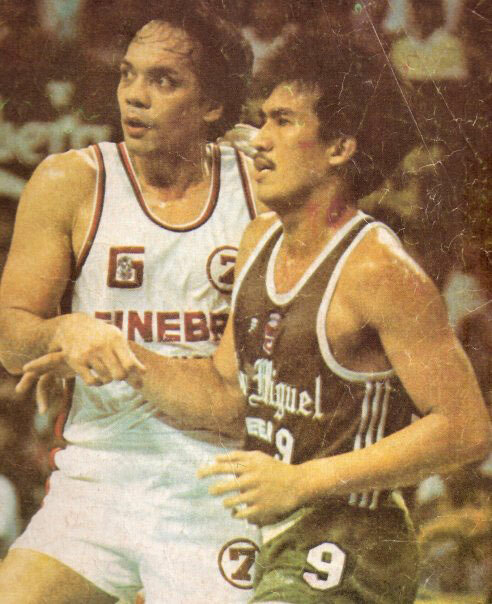 1986 saw the birth of a new rivalry: that between Tanduay starring ‘El Presidente’ Fernandez, and crowd-favorite Ginebra, with the ‘Big J’ Jaworski at the helm. But looming as a force to reckon with was the former NCC squad, having joined the pros as the San Miguel Corporation Beermen after the Edsa Revolution. San Miguel would immediately make their presence felt by clinching the last leg of the 1987 season with Abet Guidaben providing the leadership role. The old guard, Big J, tries to hold back an incoming storm, the Skywalker, Samboy Lim. In 1988, another new team would make waves. Purefoods would join the PBA by acquiring the Tanduay franchise, with a concession to bring in amateur standouts Alvin Patrimonio, Jerry Codinera, Jojo Lastimosa, Glenn Capacio and Al Solis. With Mon Fernandez leading a pack of veterans in Freddie Hubalde, Jayvee Yango, Generalao and Padim Israel, Purefoods would be competitive right from the get-go. Immediately, they would take 2 runner-up trophies in their first year of existence. Purefoods displays its young guns, Jerry Codinera, Alvin patrimonio and Jojo Lastimosa. The souped up San Miguel Beermen would capture the 1989 grand slam, only the third time in PBA history. But despite the presence of such stars as Fernandez, Hec Calma, Ricky Brown and Samboy Lim, the MVP would go to a rookie – Benjie Paras of Shell – another first for the league! The birth of new rivalries, new story-lines, new alliances, was ushering in a new dawn for Philippine Basketball. The first and second generation stars on the hardcourt. Previous Post: Will the Sun(s) Come Out Tomorrow? The 80s ushered in exciting new faces. the likes of Alvin Patrimonio, Allan Caidic, Samboy Lim, Benjie Paras, Jojo Lastimosa and many more upstarts would finally rise to challenge the old guards. But the stars of the 70s would prove to be a durable lot, with the likes of Bobby Jaworski, Mon Fernandez, Abet Guidaben still being able to dish out valuable lessons to the young ones.